Explore the beautiful symmetry of snowflakes and create your own paper versions on Wild Maths. Wild Maths encourages students to explore maths beyond the classroom and is designed to nurture mathematical creativity. The site is aimed at 7 to 16 year-olds, but open to all. It provides games, investigations, stories and spaces to explore, where discoveries are to be made. Some have starting points, some a big question and others offer you a free space to investigate. A picture is worth a thousand words — or should we say a thousand equations? Being able to visualise mathematics is hugely useful, and it's an ability that many creative mathematicians possess. A great example is the work of Florence Nightingale. Although she's mostly know for her work as a nurse, she was also a statistical pioneer who used pictures to persuade her contemporaries that hospitals had to be managed differently. You can read about Nightingale's work in this Plus article, or in a shorter and easier article on Wild Maths. The game of Drips is a real challenge! It's a game for two players, who take turns to remove as many drips as they like from a single drip trail. The person who takes the very last drip wins. You can play the game against a friend (using coins for drips) or against the computer with the interactivity on Wild Maths. Once you've played a few times, can you find a winning strategy? You might might find some inspiration in this article. Plus Advent Calendar Door #13: What is creativity? We've always found maths a deeply creative subject both to do as mathematicians and also to write about. But when we mention we've been working on Wild maths, a project to nuture creativity in maths, some people are surprised – they think maths and creativity are mutually exclusive. Part of the reason behind Wild maths is to allow people to experience the creativity that is a key element to mathematical research. We asked a number of researchers the role of creativity in their work – you can read more about what they had to say. Plus Advent Calendar Door #12: Where can you visit? 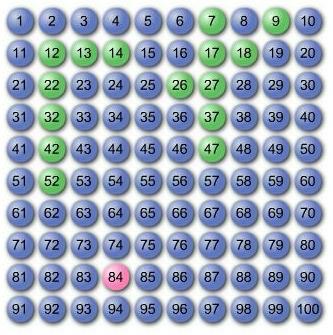 Picture the numbers 1 to 100 written in a 10x10 grid. Start at the number 42 and move around the grid by either multiplying by 2, or subtracting 5. One possible route is 42 ,37, 32, 27, 22, 17, 12, 7, 14, 9, 18, 13, 26, 52, 47, 42, 84... as shown in the image to the right. Which of the numbers can you visit? Can you visit them all? You can explore this using the interactivity on the Wild maths website, and some more questions to explore. Good luck in your travels - both mathematical and physical! Plus Advent Calendar Door #11: Sticky note beauty! It's Friday. Time to decorate your office with your office stationery!! 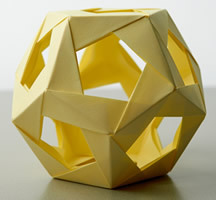 Turn your humble post-it notes into a beautiful skeletal dodecahedron. We can personally confirm that it is ridiculously satisfying making these and your desk will be the envy of your workplace. They even make great decorations for the Christmas tree! Find out how to make one on the Wild maths website!